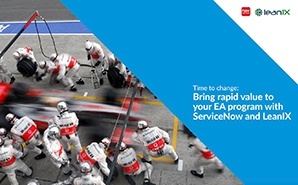 This brochure gives you an insight into how the LeanIX ServiceNow integration works and shows you how the integration helps companies to rapidly create value from their EA program. The LeanIX ServiceNow integration automates the most time-consuming phase of an Enterprise Architecture Management implementation - the collection and alignment of data. With this on hand Architects can focus on bringing value to the business by carving out insights through beautiful out-of-the-box reports. For more information on what additional added value the fully configurable and bidirectional real-time connector offers and which insights you can generate with LeanIX and ServiceNow get the brochure now.